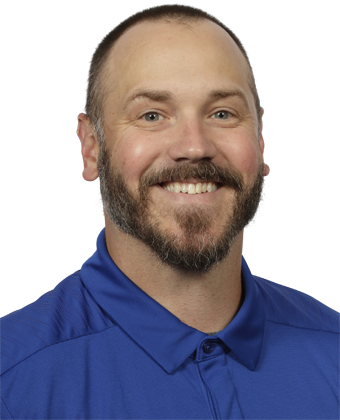 The 2019 season will mark Buck Pierce’s sixth year on the Blue Bombers coaching staff and his fourth season working with the pivots in the role of Quarterbacks Coach. Pierce was the team’s Running Backs Coach for his first two seasons on the coaching staff. Pierce works diligently on game planning and works closely with all the quarterbacks on the roster – a factor that was evident in 2018 when Matt Nichols was injured before the regular season opener and was replaced by rookie Chris Streveler, who would blossom as the season progressed. Even with the loss of their starter for the first three games of the season, the Bombers still finished with the highest-scoring offence in the CFL. In 2017, he helped guide Nichols to a career season in touchdowns (28), yards (4,472), and completions (411), while throwing only eight interceptions in 17 starts. Pierce’s quarterback also led the league’s second-highest scoring offence in 2017. Buck retired from the CFL in March of 2013. His nine seasons in the CFL were played with the Bombers and B.C. Lions, and he finished with 15,289 passing yards with 76 touchdowns in 130 games played. One of the most popular players to don a Bomber uniform during his playing days, Pierce was traded to the B.C. Lions in September of 2013 after spending close to four seasons in Winnipeg. The Kansas-born pivot became a true Winnipegger throughout that time, laying deep roots in the Manitoba capital, both personally and professionally. He is involved in countless community initiatives including Special Olympics Manitoba, Manitoba Minor Football, Ronald McDonald House, Faces of Freedom, The Dream Factory and United Way after school programs.